The striker is commonly used to light a Bunsen burner. The burner provides a clean-burning flame over which you can sterilize inoculating loops and other equipment. The striker has an advantage that it's longer than a match (avoid burning your fingers), and produces sparks, as opposed to an open flame, to light the burner. The striker has a shape similar to a large safety-pin and is squeezed in the same manner. 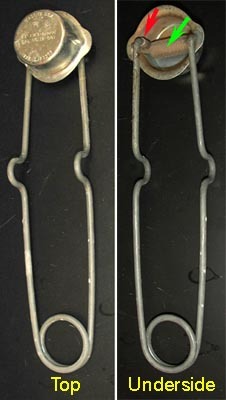 The left side of the image to the left shows the top of the striker, which consists of a metal cap placed over thick wire looped in the shape shown. The red arrow points to a flint, screwed onto one end of the wire. This end is movable across a textured metal surface (shown in green) that is firmly attached to the other end of the wire. The flint can be removed by unscrewing it from the threaded end of the wire holding it. Most scientific supply houses sell flints that can be used to replace ones that become worn-down with use. To use, hold midway, near the "bumps" in the middle of the wire, and squeeze. The first time you try it, hold the striker fint-side up to see if sparks are produced. The image to the left shows the production or sparks as the fint is dragged across the metal surface. 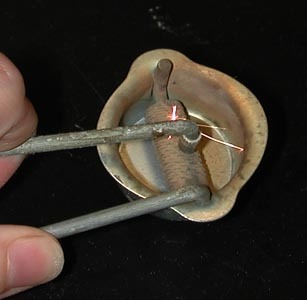 When using to light a Bunsen burner, turn the striker over and hold over the top of the burner with the gas light turned lightly on. Some gas will collect under the cap, and will ignite when sparks are produced.